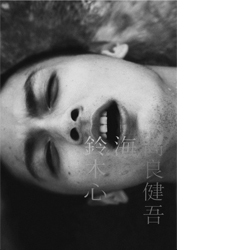 "Umi"(Sea) is a collaboration between photographer Shin Suzuki and actor Kengo Kora. It's not uncommon for Japanese movie stars to be the subject of a photobook, but this is far from a typical production. The cover of the book literally reads, "Shin Suzuki - Umi - Kengo Kora," which hints at the book's direction. The photographs in this book were shot over one long night, with a crew of just two: Suzuki and Kora. The sea is the third collaborator here, as Kora is mostly seen in the water, sometimes visibly cold. The book starts out with black and white photos taken in the middle of the night, as Kora appears to rage against the water. As the sun comes up, Suzuki switches to color, bringing out the muted colors and slight warmth of an early morning by the sea. It's as though Suzuki was using Kora as a medium through which to explore changes of light and temperature. The oversize dimensions, saddle stitching and full-bleed printing of "" heighten this sensory experience. Photographer. Born in Fukushima, Japan. Graduated from Tokyo polytechnic University, Department of Photography in 2005.